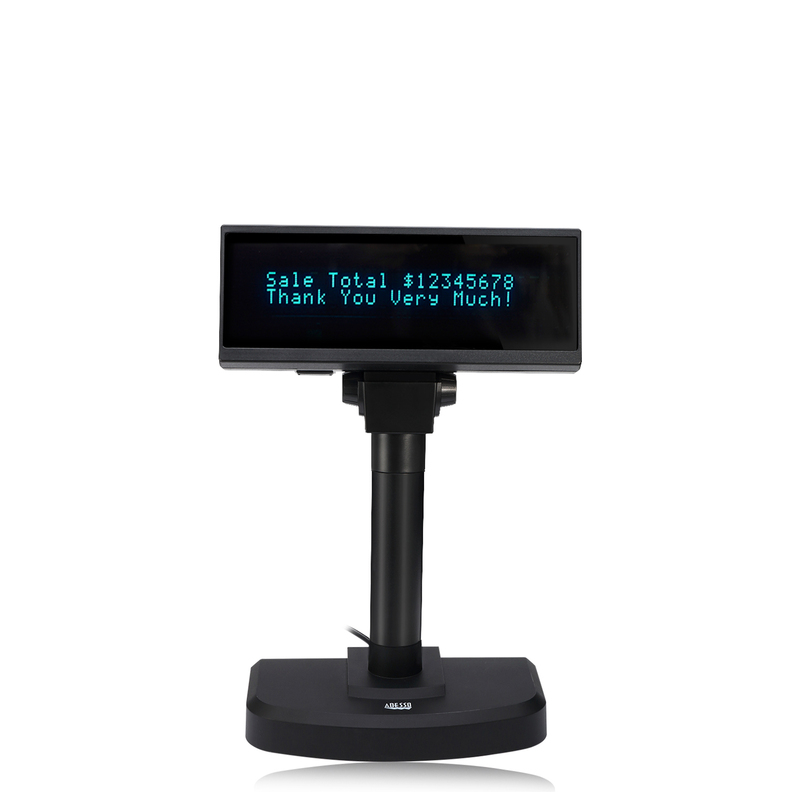 The APD-200 uses a Vacuum Fluorescent Display (VFD) tube which presents bright and easy to read characters.Because of the built-in VFD technology, the display is viewable from a wide angle. 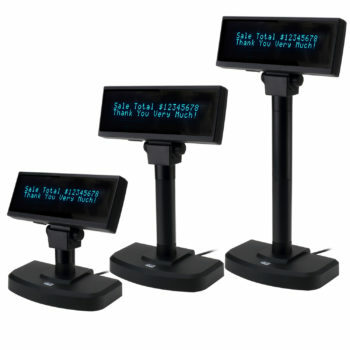 Clear, easy-to-read 20-column x 2-line dot matrix,comma, decimal point, annunciator characters on a wide viewing display. Supports over 15 languages ranging from English, French, German, Italian, to Spanish and Arabic. Use the APD-200 without language barriers or limitations. 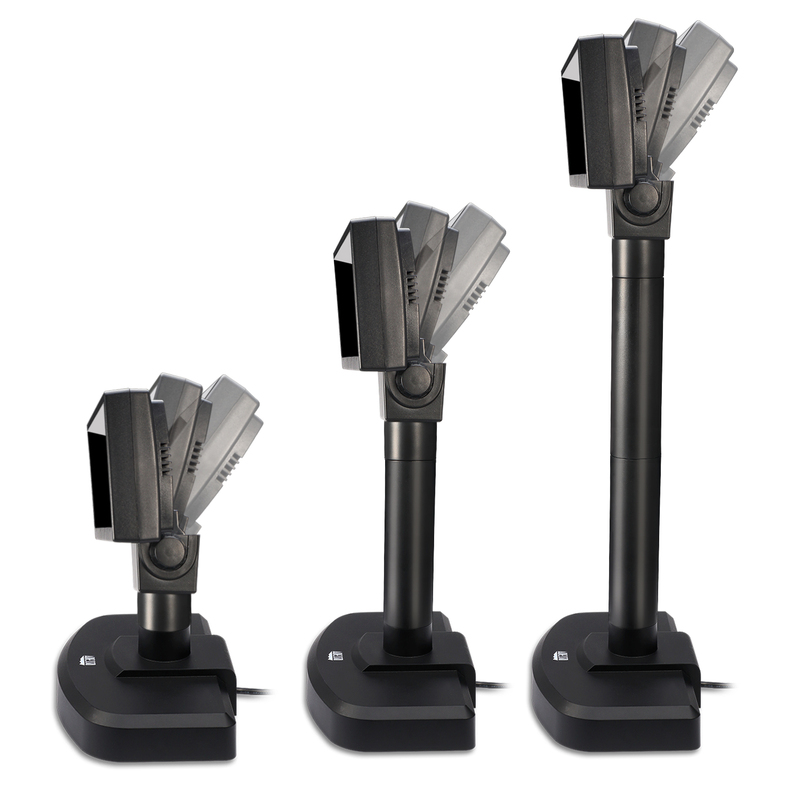 This pole display has 3 different height adjustments from the included pole extenders. 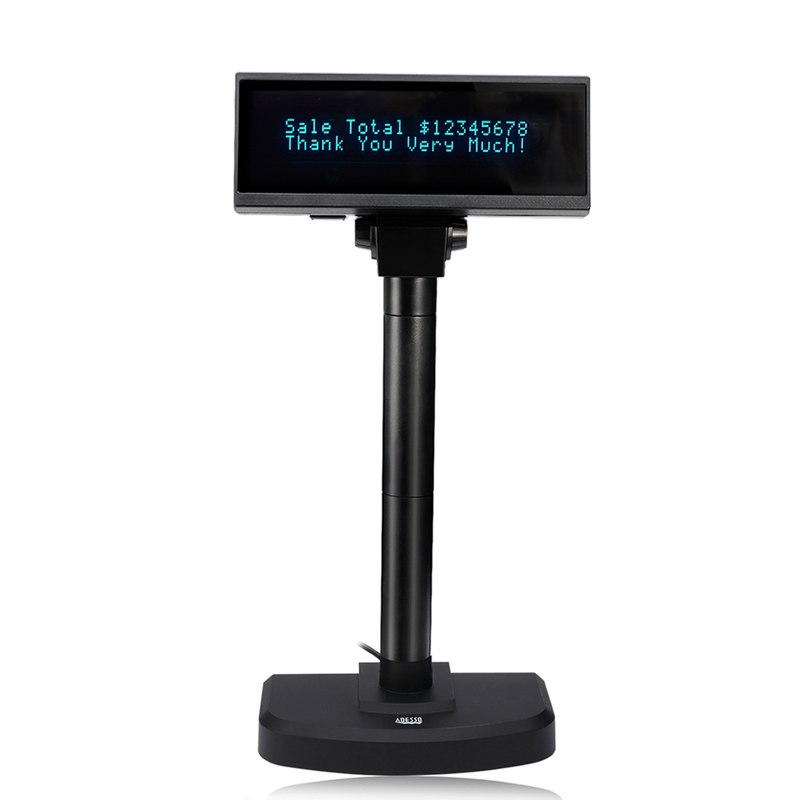 The easy pole extension installation provides the flexibility to tailor the display height for your unique application. The easy to read display also can be adjusted, and customized to your viewing preference for faster productivity. 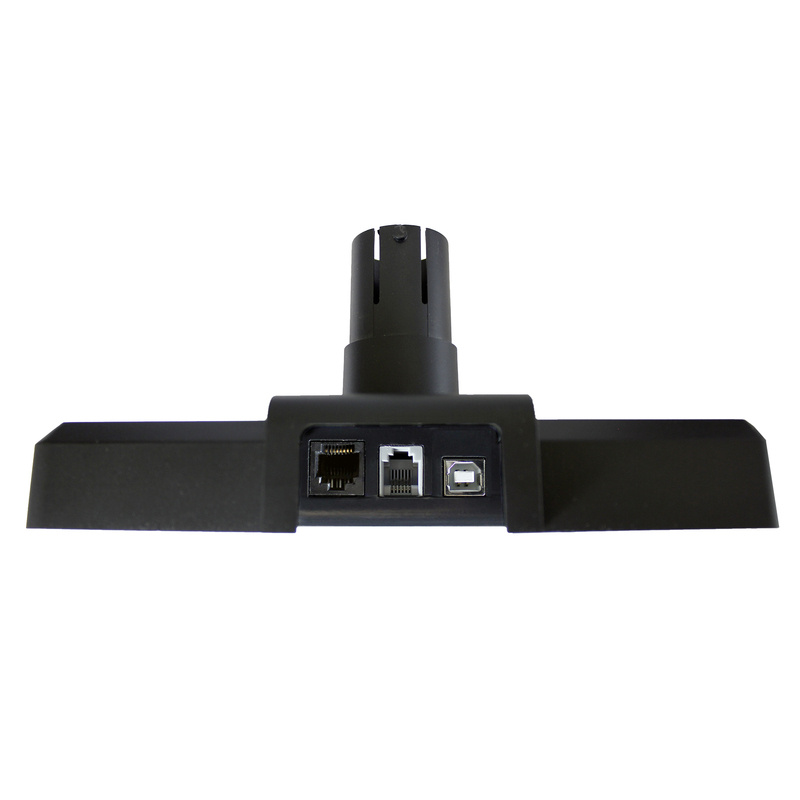 Adjust the display viewing angles by tilting up to 45° and by rotating horizontally up to 360°. 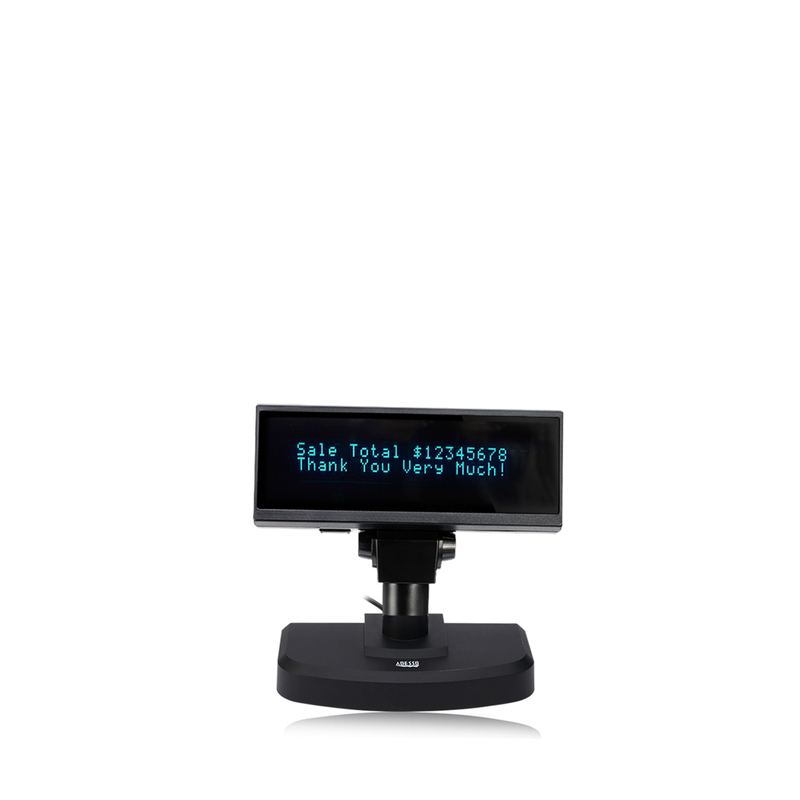 The Adesso APD-200 customer pole display uses a Vaccum Fluorescent Display (VFD) tube to present bright and easy to read characters. It has two pole sections allowing three different displaying heights and a adjustable multi-angle display head providing the flexibility to tailor displaying angles for different applications. The easy to read display contains a 5 x 7 dot matrix character font and can be adjusted and customized to your viewing preference for faster productivity. 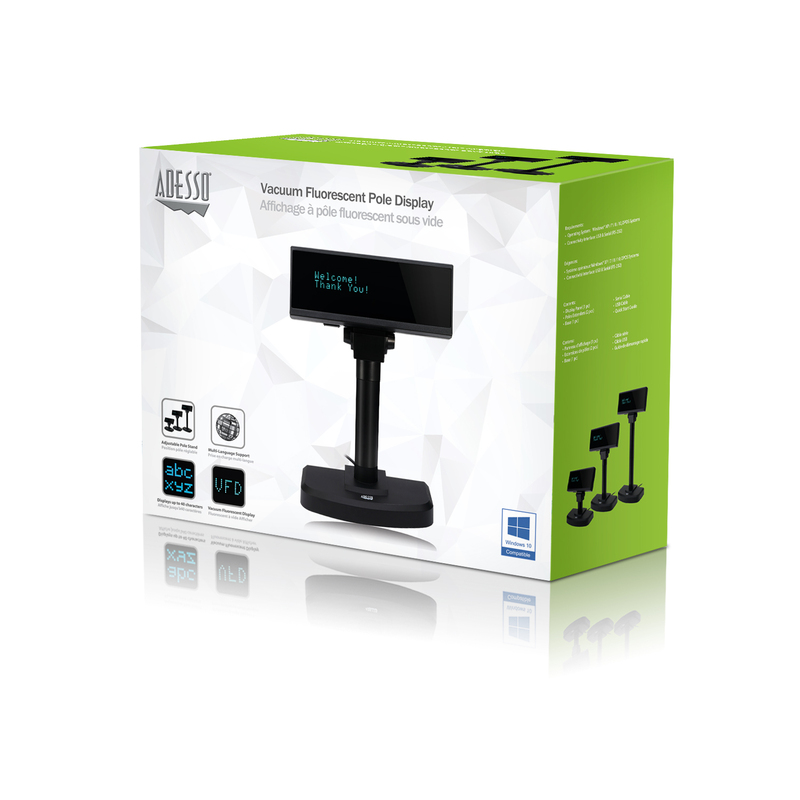 One can simply adjust the display head quickly and conveniently by tilting the display viewing angles up to 45° and by rotating it horizontally up to 360°. Finally, the Adesso APD-200 offers a variety of command modes including Epson, Aedex, Emax, Ultimate etc…supporting up to 11 different modes, over 15 different languages, and displaying 96 alphanumeric messages. English (US & UK), French, German, Danish, Swedish, Italian, Spanish, Japanese, Norwegian, Bosnian, Croatian, Czech, Hungarian, Polish, Romanian, Czechoslovakian, Slovene, Slovenski, Portuguese, Arabic, Persian, Greek, Turkish, Estonian, Lithuanina, Latvian, Bulgarian, Serbian, Macedonian & Mid-to-Eastern Europe Latin Languages.